"This outstanding marinade is great with chicken or beef flank and skirt. Fajitas never tasted better!" In a medium bowl, mix together vegetable oil, lemon juice, green onion, rosemary, thyme, oregano and garlic. Place beef or chicken in the marinade. Cover and marinate in the refrigerator approximately 24 hours before grilling as desired. This did make excellent fajitas. 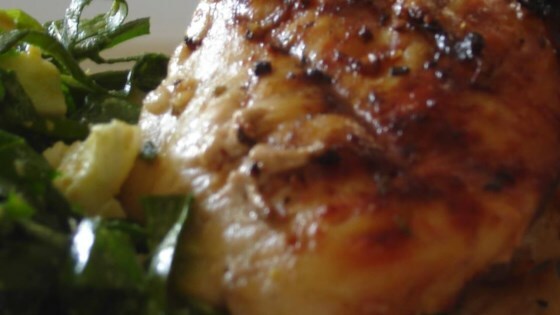 I grilled the chicken and then added a littel kosher salt. The whole family enjoyed it! I will be using this recipe again. Good. I used for chicken in the Chicken Fiesta Salad. only soaked for a half hour and it was incredible! Very good, I didn't have Thyme, and only had time to marinate for about 10 minutes, but it turned out really good. It had a very zesty flavor. the marinade tasted great, u were right fajitas never tasted better.